Help Walking Fish CSF engage with the community by attending an upcoming event. Learn more about community supported fisheries, share your ideas, meet members, and have fun! For additional information on any of our upcoming events email info@walking-fish.org. Folks at VIMS are interested in starting a new CSF. Debbie Callaway, CSF coordinator at Walking Fish, will share experiences and answer questions, and staff will release a Request for Qualifications that will help them identify interested partners that would be interested in partnering with Virginia Sea Grant for a CSF launch. Please join the Walking Fish Cooperative at Watts Grocery for an unforgettable evening with Chef Amy Tornquist on September 9th, 2013. This 5-course gourmet dinner will showcase an array of sustainably harvested strange seafood from North Carolina. Proceeds from the event will benefit Saltwater Connections, a project of the Core Sound Waterfowl Museum and Heritage Center on Harkers Island. Help make this event a success by spreading the word. 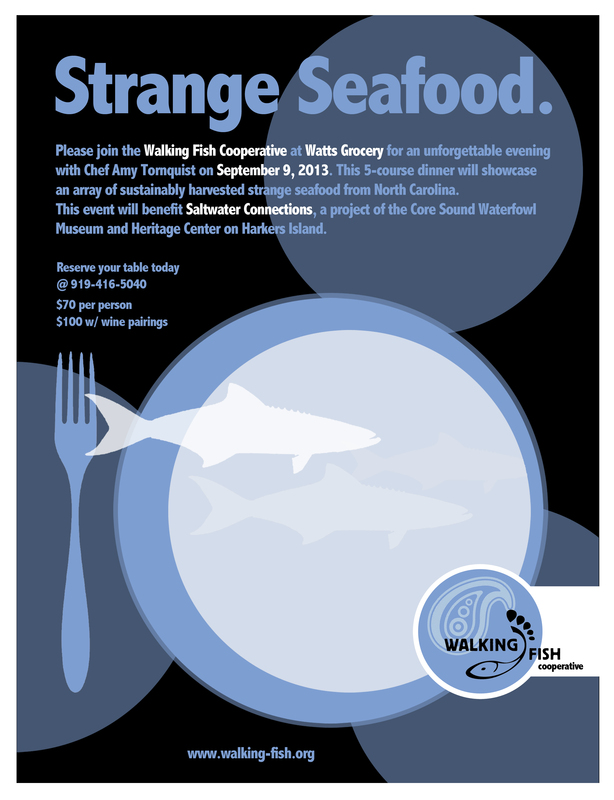 To reserve your table and support the region's unique coastal heritage, contact Watts Grocery @ 919-416-5040. For the third year, Walking Fish Cooperative has been invited to participate in NOAA’s Annual Fish Fry in Washington, DC during the National Marine Sanctuaries Foundation’s Capitol Hill Ocean’s Week. Participants came together for a National Summit, the first of its kind, representing morethan 21 Community Supported Fisheries from nine states and two Canadian provinces. Walking Fish participated in the annual Farm to Fork Picnic sponsored by the NC Agricultural Foundation. The picnic has been described as "the Best all you can Eat Feast in the Nation" by Bon Appetit. The Walking Fish Cooperative was invited to participate in NOAA’s 36th annual Fish Fry in Washington, DC during the National Marine Sanctuaries Foundation’s Capitol Hill Ocean’s Week. NOAA describes this as “the premier social event for the Agency bringing together friends and colleagues to showcase American fisheries and seafood." Joshua Stoll, one of the founding organizers of Walking Fish, will take part in a panel about CSFs at this year's International Seafood Summit in Vancouver, British Columbia. Walking Fish will be participating in the Symposium on National Ocean Policy at Bowdain College on October 15th, 2010. Come hear Niaz Dorry, director of the Northwest Atlantic Marine Alliance and one of Time Magazine's Hero's of the Planet, talk about the role of small-scale fisheries in our changing planet. Organizers of Walking Fish will be presenting at the AFS Conference along with other groups from North Carolina. Please visit the Pepsi "Refresh Everything" project to vote for Walking Fish daily! Join Sandra Kellum and Pam Morris as they prepare a Downeast feast with locally caught shrimp and flounder at Thursday's pick-up. Walking Fish was asked to participate in NOAA’s (National Ocean and Atmospheric Administration) annual Fish Fry in Washington, DC during the National Marine Sanctuaries Foundation’s Capitol Hill Ocean’s Week. Walking Fish presents results of Fall CSF to Carteret Catch board. Filleting Demonstration at Sarah P. Duke Gardens (CSF pickup) 4 - 6 pm. Private Film Screening - "The Fish Belong to the People"
The Fish Belong to the People, a feature length documentary, follows a group of family fishermen in Port Clyde, Maine as they work to save their fishing grounds from government, market structure, and themselves. With each passing season their way of life has slowly been extinguished by old ways of doing business that favors the most efficient and destructive ways of fishing over sustainability... read more & view trailer. Discussion - "Sustainable Seafood: From Water to Waiter"
The Duke Center on Global Change presentsSustainable Seafood: From Water to Waiter on Thursday, November 19 from 4 p.m. – 6:30 p.m. Featured Speaker: Polly Legendre, Culinary Director. To be followed by a reception with sustainable seafood sourced from CleanFish and Walking Fish and catered by Sage and Swift. For complete information please click here. Customers will be eating with a purpose on Nov. 13, at the latest of the Maritime Seafood Dinner series to benefit education programs at the N.C. Maritime Museum. Seafood has been an important part of the region’s diet, economy and culture, and the dinner will help the museum and also help consumers make informed decisions when purchasing seafood at restaurants and markets. Reservations and fee, call (252) 728-7317. For more information, click here. Please join us this today at 5:30pm for the Green Wave Seminar. Our own Josh Stoll (CEM '10) will be discussing DukeFish's successful initiative to start a community-supported fishery (CSF) in orth Carolina As usual, we'll be in the Repass Center at the Duke marine lab. Film Screening "The End of the Line: Imagine a world without fish." Members of Walking Fish travel to New England to learn more about existing CSF's. Three nights, four days, ten organizations. From August 17th to August 20th, we will be in New England, traveling from Cape Ann, Massachusetts to Port Clyde, Maine. Click for a list of the organizations who we will be meeting, along with a short description of each (as stated on their respective websites). Copyright © 2009 Walking Fish. All Rights Reserved. Website by Julianna Stoll.